The 2011 “Arab Spring” sparked optimism that there would be profound democratic change in the Middle East, a region dominated by autocratic and oppressive regimes. The lack of rights and fundamental freedom for women in the region was one of the most egregious manifestations of these abusive governments. While women’s rights should be a primary focus of the most prominent human rights NGOs, specifically Amnesty International and Human Rights Watch (HRW), these organizations have not directed sustained attention to women’s rights in this area of the world. HRW and Amnesty have allowed ideology and politics to prevail at the expense of true freedom for women. Impact of Gulf Money on HRW’s Agenda? The 2011 “Arab Spring” sparked optimism that there would be profound democratic change in the Middle East, a region dominated by autocratic and oppressive regimes. The lack of rights and fundamental freedom for women was the most egregious manifestation of these abusive governments. It was hoped that the ousting of dictators in Tunisia, Egypt, Yemen, and Libya in 2011, and the mass demonstrations elsewhere, would bring about fundamental reforms, especially for women. Unfortunately, these changes did not materialize. Nevertheless, women in the Middle East enjoy few rights. According to the UN Arab Human Development Reports, “nowhere in the Arab world do women enjoy equality with men,” and they “remain severely marginalized in Arab political systems.” In the 2012 World Economic Forum’s Global Gender Gap Index, the Middle East and North Africa (MENA) ranked the lowest of all regions worldwide, and six of the ten lowest ranked countries were from the region. The highest ranking MENA country (apart from Israel, which ranked 56), is the United Arab Emirates, ranking 107 out of 136. Personal status laws discriminate against women in matters of marriage, divorce, child custody, and inheritance. Some countries have oppressive guardianship systems, which severely restrict women’s freedom of movement, expression, and ability to work. Repressive cultural practices such as child marriage, female genital mutilation, polygamy, and “honor” crimes are endemic. Coupled with unsatisfactory educational opportunities and extremely high rates of illiteracy, the laws and tribal customs create an environment where there is both entrenched de jure and de facto discrimination. Given the importance of women’s rights and their contribution to the development of society, the promotion of liberal democracy, and the strengthening of other human rights, they should be a primary focus of the most prominent human rights NGOs, specifically Amnesty International and Human Rights Watch (HRW). And as noted above, given that women’s rights are the least protected within MENA countries, it would seem to follow that these organizations should direct significant resources and sustained campaigning toward promoting women’s rights within the MENA region. As NGOs with huge budgets rivaling those of multinational corporations, and with tremendous influence among policy makers and in UN frameworks, Amnesty and HRW have a distinct advantage in championing women’s rights. Research and advocacy by these organizations can give women’s issues international prominence. Conversely, violations ignored by Amnesty and HRW may lead the media, academics, and policy makers to conclude that these problems are not serious enough to warrant attention. Despite the advantages of being well-funded, highly organized, and powerful actors, campaigning on women’s rights in the MENA region leading up to the Arab Spring was not a priority for Amnesty and HRW. While these NGOs project an image of prioritizing women’s rights, both quantitative and qualitative analyses of their activities demonstrate that this is not, in fact, an accurate assessment. Amnesty’s and HRW’s campaigning was sporadic and impressionistic, without sustained advocacy, and not aimed at achieving concrete objectives. Instead, these groups chose to focus on issues related to criminal detention, armed conflict, and counter-terrorism. Often, the NGO agenda appeared to be driven by media interest and prominent world events, or as a foil to U.S. policy. Because of the core agenda drivers for these NGOs, there was relatively little campaigning on women’s issues in the MENA region from 1990 through 2011. There was no reporting at all for some MENA countries; in other instances, the minimal reporting soft-peddled abuses by repressive governments. As a result, these NGOs were ill-prepared to deal with the Arab Spring upheavals. In the aftermath of the Arab Spring, sustained campaigning by these NGOs has been all the more important given the ascendancy of Islamist parties and the backlash against women throughout the region. There is a sense of urgency among women activists for the need to “create a strong body to lobby and advocate for rights” in order to prevent further deterioration. This period of tremendous uncertainty, however, has not seen Amnesty and HRW step in to fill the vacuum. While coverage increased from pre-2011 levels, sustained advocacy specifically on women’s rights is still not the main focus for Amnesty and HRW in the region, and campaigning remains intermittent due to the core issues that determine the NGOs’ agendas. 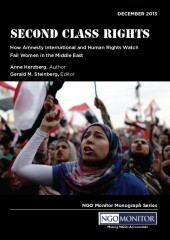 Several case studies are highlighted in this report, including coverage by Amnesty and HRW of women’s issues in the MENA region prior to 2011, the NGOs’ approaches towards supposed human rights “reforms” for women, the rise of Islamist governments in the aftermath of the Arab Spring, and conflicts resulting from the dominant political agendas of these organizations. The record of Amnesty and HRW on women’s rights suggests that both organizations need to undertake a serious overhaul of their methodologies, agenda setting, and driving ideologies in order to ensure that women’s rights receive the prominence they deserve. For HRW, no case better illustrates the NGOs soft-peddling approach on women’s issues in the MENA region than its activities relating to Saudi Arabia. HRW acknowledges that the situation for women in Saudi Arabia is untenable. Yet, despite this recognition, the organization has undertaken little substantive and sustained campaigning on the fundamental issues relating to women in the Kingdom. Instead, it has chosen to focus on relatively minor concerns that may garner media attention, but have had little to no impact on eliminating systemic abuse. HRW’s reporting on Saudi Arabia has also included analyses of whether its repressive guardianship system is required under Islamic law – a discussion that would be unthinkable, for instance, in HRW reports on gay rights and abortion in Catholic countries. Moreover, HRW’s reporting on Saudi Arabia is hesitant and often lacks the language of demand, certainty, urgency, and immediacy, and offers praise for the most minor and illusory of rights reforms. In contrast to recommendations in reports on the U.S., Israel, and other countries, there is no call for external intervention by other nations and international institutions, no demand for the establishment of international investigations or fact-finding inquiries, no call for the imposition of international sanctions and embargoes, and no demand for international prosecutions or other hard-hitting measures. This approach has also been coupled with offensive statements by HRW’s leadership such as Executive Director Ken Roth who has written “Of new #Saudi reforms for women municipal voting, Olympics a greater work role, even if segregated, will matter most.” (emphasis added) It is inconceivable that Roth would have made similar statements relating to African-Americans or other minority groups. The most troubling aspect of HRW’s soft approach is that it appears to coincide with a new strategy by the organization to intensify fundraising from Gulf elites. This financing plan raises numerous questions regarding the impact of such funding on HRW’s priorities and agenda setting, as well as HRW’s commitment to moral and ethical principles. Amnesty’s and HRW’s skewed prioritization has had several negative consequences. For instance, within the politicized frameworks of the UN, repressive regimes often dominate the agendas and promote an immoral equivalence between the abusive policies of their governments and the policies of Western democracies. By their disproportionate coverage of armed conflict, counter-terror, and Western abuses, and their failure to engage in sustained campaigning on women’s rights, Amnesty and HRW feed this dynamic. The lack of intensive campaigning allows these regimes to escape scrutiny and inoculates them from having to respond to their critics. It similarly supports excuses proffered by autocratic regimes that women’s rights are simply a “democratic façade” or evidence of “western imperialism.” Moreover, Amnesty’s and HRW’s soft-peddling of abuses, excessive praising of even the most minor reforms, and support for specific regimes that have exhibited hostility to women’s rights have served those authoritarian regimes that actively seek legitimacy and credibility. In addition, by analyzing abuses under a rubric of Islamic law, by minimally addressing violations, and by failing to speak out against abuses for fear of being labeled “Islamophobic,” these NGOs bolster attempts by MENA regimes to suppress criticism of violations under the guise of “respecting religion” and give these governments cover for attacks on free speech rights. Downplaying abuses and magnifying reforms by Amnesty and HRW can also undermine the work of local groups. Media and policy makers are more likely to ignore issues that do not appear on the reporting agenda of HRW and Amnesty. In other words, if Amnesty and HRW are not covering it, it must not be a problem of significant importance. Yet, as noted by Ramos, et al., “away from the media’s central zone of interest” is where the impact of Amnesty and HRW can be most effective. Due to their power, influence, and resources, the agendas and priorities established by the larger international NGOs can marginalize the priorities and concerns of the local organizations, even though these actors are more aware of the most pressing issues and most affected by them. The approach employed by Amnesty and HRW can also place local activists in danger: if their real problems are minimized and ignored by the international community and media, there will be fewer oversight and monitoring mechanisms in place. Authoritarian regimes can also leverage the praise of the powerful NGOs that promote a narrative of reform to attack and harass those on the ground who disagree with that assessment. It can also be argued that the failure of Amnesty and HRW to advocate for women’s rights in the Middle East as strongly as they have for issues facing the West is a form of racism. By failing to promote international human rights norms universally and equally in all countries in the world, Amnesty and HRW impart the message that authoritarian regimes and their supporters cannot handle and must be shielded from tough criticism; that women in the Middle East are not entitled to the same freedoms and political rights as women in the Western world; that they do not deserve the tough advocacy that benefit Western women; and that Middle East women must be subject to the strictures of fundamentalist cultures and authoritarian regimes that exploit religion to suppress women’s rights. Finally, Amnesty and HRW also fail their donors, who expect that their money will be used to promote human rights universally in accordance with the organizations’ mandates. Donors are usually not aware that their money furthers narrow agendas that bolster the power of authoritarian regimes. The current approach to women’s rights by Amnesty and HRW has immorally contributed to the politicizing of human rights and the ongoing dilution of their universality. By prioritizing women’s rights, these groups could play a greater role in promoting true reform for the MENA region, which might lead to the blooming of an actual Arab Spring.